Technos has introduced the Super5000K 7K Model neuro-visual sensor. This is the world’s highest precision visual inspection system, and can detect spots 0.05mm in size at a distance of 2m, with a 1.4m field of vision. This is 1,000 times the resolving power of a conventional 4,000 pixel line sensor CCD camera, and 4,000 times that of a full HD camera. Conventional CCD-based equipment has had difficulty detecting color variations. By applying the principles of human vision, Technos has achieved a sensor with 100 times the precision of human eyes, making it possible to detect color variation. Pricing for the minimum configuration starts at an equivalent of $240,000, and runs up to between $470,000 and $730,000, depending on the particular specifications. 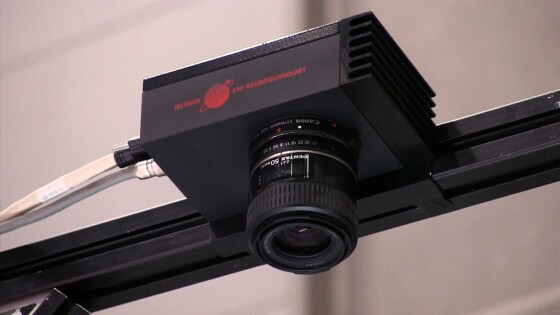 Technos estimates that about 240 companies listed on the first section of the Tokyo Stock Exchange will need equipment with this level of precision. The company aims to sell about 10 units per year to the automobile, steel, semiconductor, and liquid crystal industries. Technos has been awarded patents in 14 countries around the world. With inquiries coming from foreign countries, it is looking to expand overseas as well.